Welcome back to the fourth installment of my What I Eat In A Day series, where I chronicle literally everything I eat on a particular day. I know it sounds weird, but I honestly love reading posts and watching videos like this to give me 'food-spiration' and ideas for my own meals. As you may remember from my last few WIEIAD posts, I have turned to a Vegan, Plant-Based diet and I've honestly never felt better, both inside and out! This What I Eat is totally all over the place, but somedays I don't have a lot of time to make food because I'm so busy so I guess it's a pretty accurate reflection of the way I generally eat- sometimes there is just no structure! 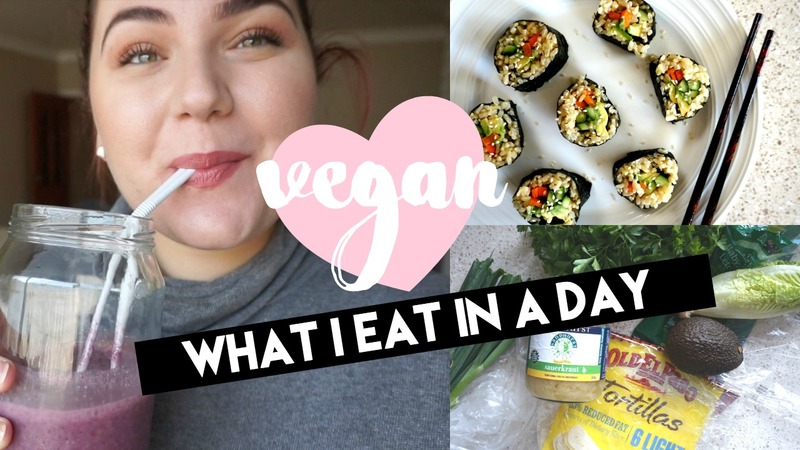 Please let me know if you would like to see more of these WIEIAD posts and let me know of any questions you may have in regards to veganism and plant based eating! I want to eat all the food. It looks so delicious! Amazing post, great video, I love your blog very much, truly inspiring, thank you for sharing!!! Even though it is all vegan and plant based I must admit that it just looks so delicious! You eat so healthy, Anjelique! (As I am sitting here craving soy ice cream. There's always tomorrow!) That smoothie looks delicious! Ah this a lovely post, I love seeing what people eat and how healthy you are!! It all looks so lovely but do you find you ever feel hungry in the day as that is my biggest problem!! Aww your menu looks so good and yummy! Love that smoothie! I love watching videos like this, aside from the fact that they always make me hungry they also always give me some brilliant recipe ideas. Those vegan sushi rolls look so delicious, we have a serious craving to make these immediately! Thanks for sharing, we're happy to hear you feel energized and healthy!